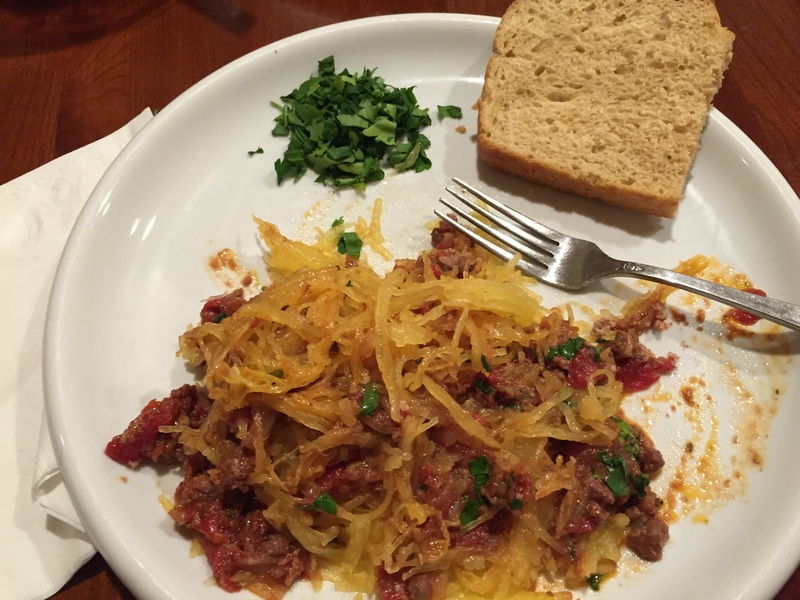 Bolognese with homemade peasant bread & spaghetti squash. It’s getting’ Italian up in here. There are some inherent comfort foods in my life spawning from my upbringing and a really good pasta sauce is one of them. To Italian households your tomato sauce is a family recipe; other sauces, restaurants, etc just don’t taste right. As cold weather has finally started to settle in to Austin, I needed something filling and hot to warm my soul. When you want all the flavors without so much fat you can substitute the ground beef with ground turkey and serve with spaghetti squash instead of pasta. Saute the beef over medium high heat in a deep pot or sauce pan for about 5 minutes, stirring constantly. You don’t want to cook it through, but you definitely want it to give up a lot of its fat. After few minutes, when a significant amount of grease has been rendered, but the meat has yet to really brown, turn off the heat and strain the meat with a slotted spoon into a bowl and set aside. Dispose of the rendered fat. If you want some added flavor, you can also do 1/2 lb beef with 1/2 pound ground pork, and you can use ground turkey for a healthier option, of course, skipping the step to render any fat. In a deep pot over medium heat, add the olive oil and butter. Once the butter is melted and bubbling a bit, add the onion and garlic. Cook over medium heat until the onions are just transparent and the garlic is no longer raw, about 5-7minutes. 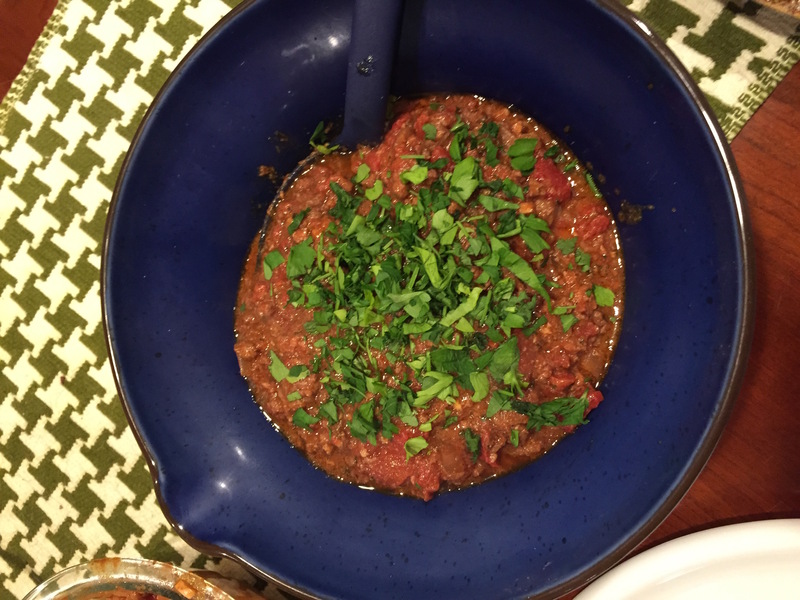 Move the onions to one side of the pot, exposing a bare area and dollop the tomato paste there, to toast a bit, about 1-2 minutes. 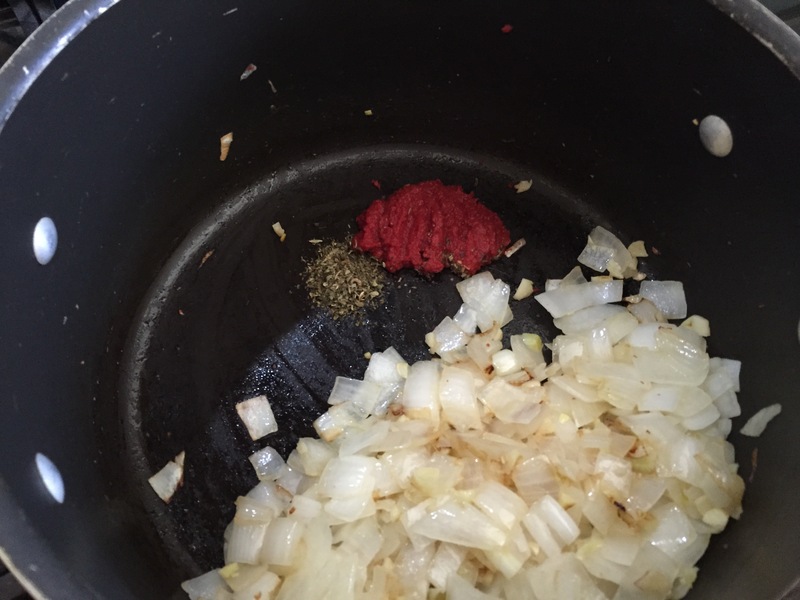 Stir the tomato paste with the onions and garlic, and then add the oregano and basil. Stir, letting the flavors marry and carmelize, about 3 minutes. Add the 2 cans of tomatoes, red pepper flakes, wine, and soy sauce, stirring well. Add the meat back to the sauce and let it simmer over medium heat for 10 minutes. Stir in the lemon zest, and allow the pot to continue to simmer over medium heat for another 10 minutes or so or until the sauce has thickened. Serve over your favorite pasta or spaghetti squash and top with shredded fresh basil and Parmesan cheese. 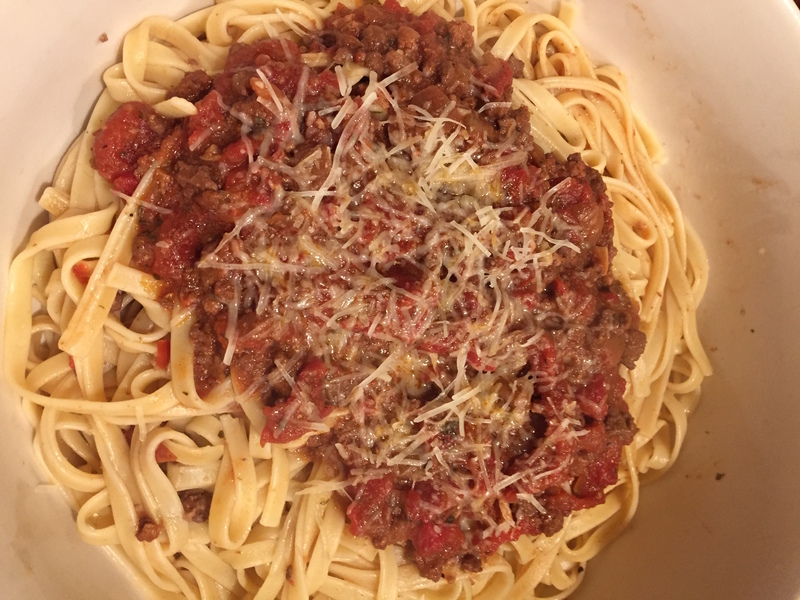 This entry was posted in Food, Geek Chef, Recipes, Uncategorized and tagged beef, bolognaise, bolognese, comfort food, easy, ground turkey, hamburger, healthy, hearty, italian, maggiano's, olive garden, pasta, spaghetti, squash, winter classic. Female, agnostic, loves too much (re: family & Asian food). Likes sci-fi, video games, and going to museums alone. Allergic to tannins and most people. The U.S. needs to be on the metric system. All written works and photographs are the sole possession of the author unless otherwise noted. © 2010-2012 Kate Couch. All rights reserved.